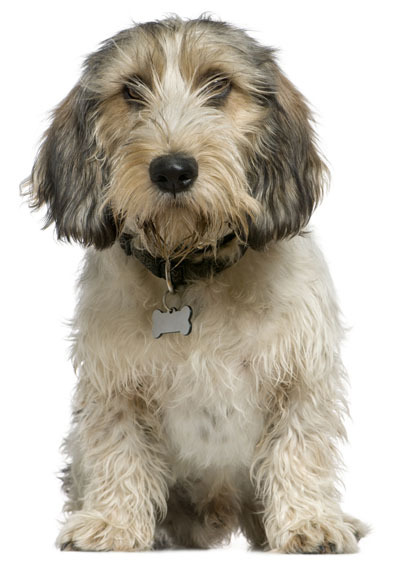 Learn about the temperament and personality of the Petit Basset Griffon Vendeen. Discover what he's like to live with, his traits and characteristics and how he generally behaves. And look at lots of Petit Basset Griffon Vendeen photos. The Petite Basset Griffon Vendeen (nicknamed the "Happy Breed") is an extroverted, independent, confident, and alert dog. He is both hunting dog and family companion: rugged, active, bold, and exuberant. Bred for centuries to hunt, a PBGV who is going to be a family pet will need to be socialized around cats and other small animals. They have a strong chase instinct. They also have a strong nose, and will wander off following an interesting smell, so a PBGV needs to be kept on a leash or in a fenced-in yard. They are independent thinkers, yet they are willing to please. They do well in obedience, agility, tracking, flyball, and hunting trials. They are also becoming popular as therapy dogs, and have even been used for search and rescue. These are certainly not couch potato dogs -- these dogs need something to do and are always doing something. They are generally good with children, other dogs, and other pets. The PBGV makes a good watchdog, but once the burglar breaks into your house, your PBGV will probably bring him a few toys. This breed needs daily exercise. They are natural athletes who can run fast and far. If they don't get enough exercise, you will certainly hear about it. This breed likes to bark, and many of them howl. They also like to give kisses, especially when their beards are wet. This charming dog fits in well with a busy family. He is curious, sweet, smart, energetic, charming, and his tail seems to never stop wagging. The Petit Basset Griffon Vendeen is harder to train than most other dog breeds. He learns new commands more slowly than the majority of other breeds. You will need to be extra patient when Training him. The Petit Basset Griffon Vendeen sheds a fair amount of hair. You'll find hair stuck to your couch, carpets, clothes and everything else in your home.